next post: Argentina and Greece – credible analogy or not? The fiscal austerity imposed on the southern European nations such as Greece and Spain has been imposed by the Troika with two justifications. First, that the private sectors in these nations would increase spending as the public sector cut spending because they would no longer fear the future tax hikes associates with rising deficits (the Ricardian argument). The evidence is clear – they haven’t. The second argument was that massive cost cutting (the so-called internal devaluation) would improve the competitiveness of the peripheral nations, close the gap with Germany and instigate an export bonanza. It was all about re-balancing we were told. The evidence for that argument is clear – it was a lie. The massive impoverishment of these nations and the millions of jobs that have been lost and the destruction of a future for around 60 per cent of their youth (who want to work) has all been for nothing much. As was obvious when they started. At the onset of the crisis, many graphs appeared in official publications from various organisations including the OECD, the IMF, the World Bank, the European commission, and the list goes on, which showed movements in the real effective exchange rate for the peripheral Euro nations compared to Germany. The graphs were typically indexed by the year 2000 and by 2008 or 2009 they showed that the gap between the PIIGS and Germany had opened widely with the real effective exchange rates for the PIIGS rising and for Germany falling. The conclusion was that there was a major gap in trade competitiveness between Germany and its Euro-area partners due to excessive wages, poor productivity, and excessive regulation in the peripheral nations. There was barely a whisper about the fact that Germany was suppressing domestic real wages growth and therefore stifling domestic demand. There was barely a whisper that the only way Germany was growing was to export to the rest of Europe. The emphasis was all on the over-spending nature of the peripheral nations even though that so-called “over-spending” allowed Germany to grow while reducing the real standards of living for its own workforce. It beggared belief how people have tolerated this one-sided construction in Europe. The blame was always sheeted hometo the weaker nations. Given this construction, it became very easy for the Troika to argue that a major internal devaluation was required in the peripheral nations to redress the competitiveness gap. It wasn’t surprising that this argument also was used to justify attacks on the key targets of the free market lobby: public sector employment, welfare payments, trade unions, and wages generally. It also wasn’t surprising that the attacks on the peripheral nations were reinforced by long-held cultural and ethnic stereotypes about the profligacy or laziness of the fat Greeks or unreliable Italians, or warm-blooded Spaniards or the dim-witted Irish. After all if you want to mount a massive attack on the living standards of a nation without the democratic consent of its people then it is essential to demonise those same people. Divide and conquer has been one crude strategy the neo-liberals have used to break up worker solidarity. And so fiscal austerity was imposed. Harsh cutbacks. Jobs destroyed in their millions. Pension entitlements hacked. Poverty rates rose. In some nations, 55-60 per cent of the youth are unemployed, most of whom will face a bleak future – without education, without skill development and without workforce experience. Many will become junkies, thieves and dissidents – and who could blame them. The two promises outlined in the introduction were clear. Second, that the cost cutting (the so-called internal devaluation) would improve the competitiveness of the peripheral nations, close the gap with Germany and instigate an export bonanza. The Greek economy has been buoyant for several years and growth is expected to remain robust for some time. The risks to the outlook are tilted to the downside. In the near term, risks stem from a weaker external environment and a potential liquidity squeeze of banks. Over the longer-term, a persistent loss of competitiveness raises the prospect of a prolonged period of slow growth. Averting this risk requires improving cost competitiveness through wage moderation, an environment that encourages product upgrading, and a broadened effort to reform product and labor markets. On May 25, 2009, the IMF released the next – Staff Report for the 2007 Article IV Consultation Greece – and claimed that “fiscal consolidation cannot be postponed” – that “There is no room for fiscal stimulus” – and that tax hikes, public service cuts, privatisation, wage cuts and social security reform were necessary to “restore competitiveness”. A year later, on May 2, 2010 the IMF continued claiming more cuts were required because the “economy needs to be more competitive” (Source). As each year passed, the flawed growth forecasts were just adjusted to be positive in the next year. Then the next. And so it went. As I have noted in the past, a surgeon who delivered such damaging outcomes would be jailed for malpractice. The IMF has a criminal record by any measure of standards. Neither of the promises have been delivered. It is clear there has been no major private sector spending burst. As unemployment has risen and aggregate demand falling further consumers and firms are bunkering down. There will be no widespread consumer revival while the threat of unemployment remains. Firms will not enter a new investment phase while the sales prospects are so bleak. The austerity economists should have run up a psychologist or consulted some sociologist or two to learn about human behaviour. But what about the export led bonanza? I have noted some comments occasionally here that the rebalancing of competitiveness is finally starting to work in the Eurozone. My reply is – the evidence doesn’t tell me that. Before I consider that though a point needs to be clear. Eventually, these scorched earth nations will grow again. At some point someone will see an investment opportunity and the multipliers will take care of the rest. No-one doubts that. But the damage that will have been caused in the meantime will resonate for decades. And when you realise these nations could have avoided the recession altogether with some nimble fiscal initiatives then it beggars belief that they would have chosen the route they have taken. The Bank of International Settlements publish monthly Effective exchange rate indices – for 61 countries from January 1994. An effective exchange rate (EER) provides a better indicator of the macroeconomic effects of exchange rates than any single bilateral rate. A nominal effective exchange rate (NEER) is an index of some weighted average of bilateral exchange rates. A real effective exchange rate (REER) is the NEER adjusted by some measure of relative prices or costs; changes in the REER thus take into account both nominal exchange rate developments and the inflation differential vis-à-vis trading partners. In both policy and market analysis, EERs serve various purposes: as a measure of international competitiveness, as components of monetary/financial conditions indices, as a gauge of the transmission of external shocks, as an intermediate target for monetary policy or as an operational target.2 Therefore, accurate measures of EERs are essential for both policymakers and market participants. If the REER rises, then we conclude that the nation is less internationally competitive and vice-versa. 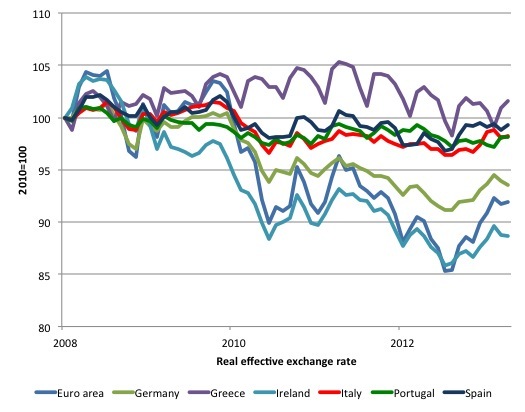 The following graph shows movements in real effective exchange rates since January 2008 until April 2013 for selected Eurozone nations and the Euro area overall. Now consider the next graph, which compares the peripheral nations of the Eurozone with Iceland. Of-course, the fundamental differences between the Eurozone nations and Iceland is threefold: (a) Iceland issues its own currency while the other nations use a foreign currency; (b) Iceland enjoys a floating exchange rate; (c) Iceland sets its own interest rate. These are the differences which define whether a nation is sovereign in its own currency or not. Modern Monetary Theory (MMT) indicates that nations that the sovereign in their own currencies will enjoy better prospects, if the government deploys the characteristics of that currency monopoly to advance public purpose in an appropriate way. 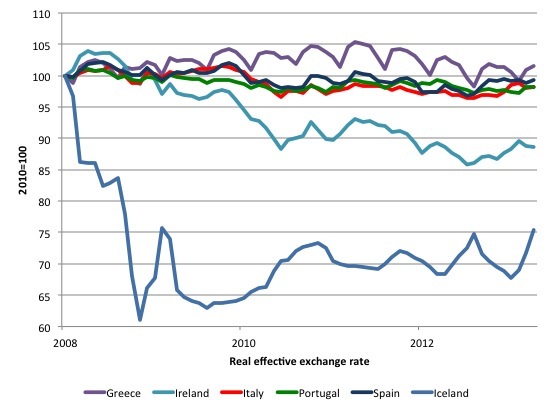 Consider the scale of the real effective exchange rate drop for Iceland compared to even Ireland. And while you’re doing that think about Greece. The Euro nations have not succeeded in significantly increasing their competitiveness despite massive cuts. Internal devaluation is not an effective way to increase international competitiveness. The costs of such a strategy are too high and society breaks down before you get close to the goal. For Iceland, the work has been done by the exchange rate moving. Less painful and more effective. The depreciation in Iceland created a major change in the trade sector. Their exports became much cheaper and demand grew rapidly at the same time as import demand fell because of the rise in prices in the newly restored local currency. For analysis of how Argentina allowed its exchange rate to drop significantly in 2002, please read my blog – A Greek exit would not cause havoc – for more discussion on this point. Note that the real effective exchange rate in Iceland evened out after its initial plunge. That is a common pattern. After an initial plunge, the nominal exchange rate stabilises as growth returns. While the dogma is that a nation that cuts its wages will improve competitiveness is rife, the reality is clearly different. The problem is that if a nation attempts to improve its international competitiveness by cutting nominal wages in order to reduce real wages and, in turn, unit labour costs it not only undermines aggregate demand but also may damage its productivity performance. If, for example, workforce morale falls as a result of cuts to nominal wages, it is likely that industrial sabotage and absenteeism will rise, undermining labour productivity. Further, overall business investment is likely to fall in response in reaction to the extended period of recession and wage cuts, which erodes future productivity growth. Thus there is no guarantee that this sort of strategy will lead to a significant fall in unit labour costs. There is robust research evidence to support the notion that by paying high wages and offering workers secure employment, firms reap the benefits of higher productivity and the nation sees improvements in its international competitive as a result. No-one is denying that economies such as the Greek economy have structural issues which bias them to higher inflation. The point is clear that these problems are never going to be solved more quickly by impoverishing the nation. A freely floating exchange rate (which means exit from the Euro) will be a more effective way of attenuating the imbalances that have emerged between northern and southern Europe with respect to trade. However, the real bonus that an exit would bring is that nations such as Greece can then unambiguously concentrate on a domestic growth strategy and put an end to its recession. But in terms of the two promises – Ricardian growth responses and net export bonanza via increased competitiveness – neither have been delivered and we have enough data to conclude that categorically. I have a long flight to catch – so …. Yesterday you discussed ABC and the media in Australia. I have to say that from watching the media in the US I get the feeling that we are in the mist of a world wide boom. Europe has turned around, emerging markets are exploding, and if the US would just its house in order we could participate in the expansion. And let me add that Japan will soon be going gangbusters. There is no wonder the stock market is exploding. My questions are from where is this optimism coming and am I correct in not being so optimistic? There must be a deeper objective behind these strange events as organizations cannot F$£k up this bad. I don’t think that was the objective to be honest. I think it had something to do with the transfer of these countries raw material ration books to German & Asian entrepots so that they could continue to supply the deficit Anglo countries. You can clearly see the UK benefiting from inter euro trade changes during this time period. Is there really anything that countries like Greece could have accomplished without leaving the Euro Zone? Second, devaluation doesn’t come without a cost. A sharp devaluation means a significant reduction in the standard of living for everybody in an open economy like Greece’s because of worsening terms of trade. We can argue that the current situation is actually better for the 75% of Greeks who still have jobs. As I see it, about 3/4 of Greeks under 65 pay no significant price for the adjustments imposed on Greece while the other 1/4 pays a very high price. With devaluation, everybody would pay a small price. That has always been the problem with persistent high unemployment. It creates a severe inequality between those who have a job and those who don’t. Devaluation certainly means increased import prices and hence a reduced standard of living, as compared to where a country is running an unsustainable balance of payments deficit. Or where it is running further and further into debt so as to fund that balance of payments deficit (think “Euro periphery”). But that’s just the equivalent of someone enjoying an enhanced standard of living by going further and further into debt with their credit card. You can’t really claim that switching to a more responsible use of your credit card is a poor solution to the problem because it involves you in reducing your standard of living. It’s conceivable that the elasticity of supply and demand for a country’s exports and imports is so low that devaluation DOESN’T enable it balance its external position till it has reduced its standard of living to a disastrously low level. But I don’t believe that obtains for Euro periphery countries. That is, they have a range of exports, tourism being just one, where demand would respond to a cut in prices. nice and interesting piece again. Just one question concerning the “BIS effective exchange rate indices”: I guess you used the narrow indices (comprising 27 economies) in the first graph, but I’m not so sure how you’ve calculated the second. Iceland should be the broad index (comprising 61 economies), but what about the other countries in your second graph – broad or narrow indices? Just by the way: There’s a slight mistake in the labelling of both graphs: It ought to be January 2008=100, not 2010=100. I would hazard a guess that the Best Effective Exchange Rate is BEER. Why do we tolerate banks? Monetary sovereigns certainly don’t need them. And as for the so-called “private sector”, can’t it create money forms that don’t require government-provided deposit insurance and a lender of last resort? I am trying to understand how to interpret REER. I can see how it measures changes in competitativeness for a particular country, but can we use these indices to compare countries? If not what is the equivalent measure to be able to compare countries? You’re a bit off topic, far as I can see. Still, hopefully Bill won’t mind if I answer your point. Private banks can indeed create money without any help from government sponsored deposit insurance or the lender of last resort facility (DI&LLR): private banks were doing just that before governments and central banks introduced DI&LLR. But the problem was that a lot of innocent people lost a great deal of money when banks went bust. But unfortunately DI&LLR just encourage banks to be reckless. So, what to do? My preferred solution is to make depositors choose between two options: first have their money lodged in a 100% safe manner. In that case the money is not loaned on or invested (e.g. it’s lodged at the central bank) and the state guarantees it. There is little taxpayer exposure there because the money is near 100% safe anyway. Second option (where a depositor wants interest) is for the depositor to let their bank lend on their money. But in that case the depositor carries all the risk. So there’s no taxpayer exposure there either. Plus banks just can’t go bust because they don’t owe anyone any specific sum of money. Result: no bank subsidies, plus banks cannot go bust. That kills several birds with one stone. I am interested in reading more of your articles after having found just two in a Google search. I speak/read German fluently. There seems to be very few people in the German-language region of Europe who show interest in MMT and JG. So you appear to be one of the few. I am sure Bill would forward you my email address if you want to contact me. Surely,the terms of trade will worsen the standard of living for everybody after a devaluation of the (new) currency,given the fact that the trade deficit persists (though the shrink of household consumption has contributed to a large reduction compared to the previous years,with increasing exports contributing a little to the reduction,despite the mainstream view).Also a thing that makes it more hard is that the productive structures of the economy have for a decade adjusted to the role of the economy within the euro-that is,being a net importer,with private credit (after the euro the access to low-interest credit increased for the majority of the population) fueling the household consumption between 2001-2009.That consumption was largely been directed towards imported goods.The problem with that is that the industry structure adjusted to that,and “downsize” in industry was large in the last decade(reference needed-got to check some figures in the Institute of Labour-GSEE last year’s report).So putting up “barriers” (removing the incentive) to import (due to depreciation of currency) may lead to a restructure in domestic production-industry and agriculture. Another fact is that undocumented work is largely spread.Due to the collapse of the labour market,the tax burden of employer taxes,and the abscence of government supervision (the under-staffed Labour Supervision organisation here does a pretty bad job) it is unofficially estimated (as i read in the newspapers) to be 30-40% of the unemployed population (note that it’s about quantity,not quality-it may be one week of undocumented work or a longer period or a 3/4-hour work etc). So,my point is that if we see again the facts,its about the 60-70% of Greeks who pay a significant price for the “fiscal adjustments” made. There has been some foreign investment encouraged by the internal devaluation, although it\’s all of the sort that invites satire. Oil lords are buying up Greek islands at bargain prices, while yield-starved foreign bond speculators have driven up the price of Greek sovereign debt. One thing for sure, for any small nation that joins a big trade or currency bloc: they can kiss their sovereignty or autonomy sweet good-bye. Liked the article. Always thought that a rush for monetary union was far to soon. Our energies would have been better spent making Europe more democratic and transparent. Differences between member nations should have been levelled out over time. As the world becomes multipolar, a strong Europe is important. But steps of change have order, getting the structures of power and accountability right is step one. Only once and if that can be accomplished can we even start to travel the road of monetary union. It feels more like our masters entered a power grab without care or thought to the consequences of such a move. Europe and its credibility has suffered as a result. I wasn’t really off topic since the banks are the root of all these troubles. 1) Eliminate all borrowing by the monetary sovereign. It has no business lending either. 2) Forbid surpluses by the monetary sovereign. 3) Completely abolish the central bank’s ability to create fiat. Heck, just abolish the central bank altogether and let the various Treasury Departments of monetarily sovereign governments provide accounts for their citizens. 4) Bailout the entire population equally with new fiat till all bank accounts are 100% backed by reserves. This is not only just but necessary for the transfer of reserves to Treasury Department accounts. 5) Encourage the use common stock as private money and eliminate any avoidable advantages fiat has wrt the payment of private debts. We can abolish the banking cartel smoothly and establish ethical money creation with a little thought and a sense of justice.